Before diving into the KStreams program, a description of setting up Hosebird and how the classification will be performed is in order. In order to use Hosebird an appication needs to be registered with Twitter and access tokens generated. The first step is application registration. Once the application is created. copy the consumer key (API key) and the consumer secret from the screen and save them in a properties file. Next click on Create my Access Token to generate the tokens required to give your twitter account access to the new application. Full instructions on this process can be found here. The next step is to start streaming the twitter data and publishing individual tweets to a KafkaProducer. The search terms used are Real Madrid,#realmadrid,@lemondefr,Le Monde. These terms proved to have a nice mix of all three of the target languages. Nothing to fancy here, jut pull a tweet from the queue, create a ProducerRecord, and then send the message to kafka. Now the data stream is up and running. Up next is a look at how the data classification is done. Describing how language classification works is beyond the scope of this post. Just a brief description of the classes used and the practical application to our problem is covered. The LingPipe library is being used to classify the data. Specifically, the DynamicLMClassifier class is what will be trained and used to classify the tweet data. The DynamicLMClassifier is a language model classifier that uses categorized (annotated) character sequences for training and classification. spanish#se ven cuatro hoteles que pueden citarse entre los más lindos de París. french#Huit cents. Mais je m'étonne si monsieur à jamais vu la couleur deleur argent. A ‘#’ is used as the delimiter as several portions of the training text contains commas. In total there are roughly 50 lines for each language, not extensive, but enough for our purposes. The train method populates the categorySet (languages) and the annotatedData list which contains both the category(language) and the language text. The heart of the program is the trainClassifier method which iterates over the annotated data, creating a Classification object from the language label, a Classified object from the data and the classification. The Classified instance is passed to the classifier via the handle method which provides a training instance for the given string. The training code shown here was inspired heavily from the LingPipe Cookbook. Now that all the setup has been covered, it’s time to move on to using kafka-streams to process the twitter data. Now it’s time to cover the main point of this post, running a kafka-stream application to perform language classification on incoming messages. 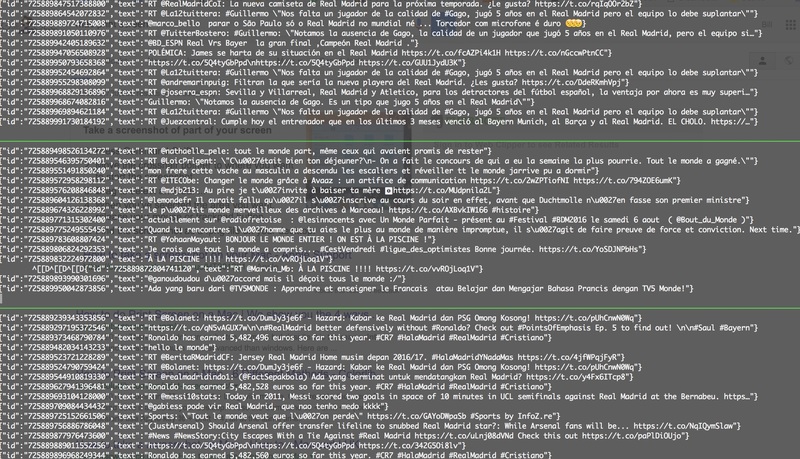 Then the language classification is used to split the original stream into 3 new streams of messages. On line 4 the Classifier object (just a wrapper around the Ling-Pipe classes) is created. On line 5 the classifier is trained with the given data file described previously. On line 7 a KeyValueMapper instance is created. While this is just one line of code, it is the key of the entire program as this is where the classification occurs. The text of the tweet is classified and the result is used as the key for the KeyValue pair. Lines 10-12 are the predicates used to filter the incoming stream. Line 16 is where all the work comes together. The tweetKStream uses the KStream.selectKey method to create a new key, which is the language classification of the value. Then the KStream.branch method is called using the three predicates created previously. The KStream.branch method takes N number predicates and returns an Array of containing N KStream instances. Each KStream in the Array produces KeyValue pairs that evaluate to true for the respective predicate from the branch method. A KeyValue object will be associated with the first prediate that it matches on. While the results are not 100% accurate, for the amount of training done it’s not all that bad. Notice that the Real Madrid results were concentrated the most in the English and Spanish topics, while the Le Monde twitter results showed up exactly where expected. 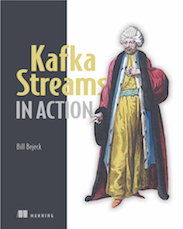 While langage classification is not new, and can be done in a variety of ways, hopefully from this little example we can see how Kafka-Streams can be used to perform analysis/transformation on incoming data that previously required using a separate framework. 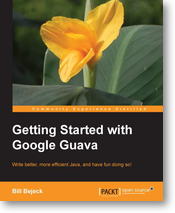 Source code and instructions to run examples for this post. Note that all of the streaming examples use simulated streams and can run indefinitely.